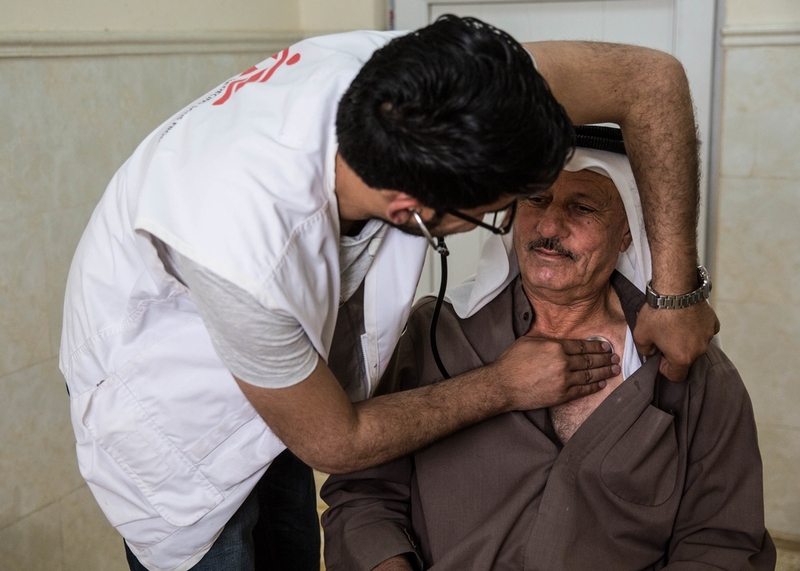 Iraq: "A hospital can never stop working, even during a war"
When the militant group overran his home city in June 2014, Baroj and his family fled 75 kilometres north to Dohuk. Now Baroj is assistant coordinator of MSF’s project in Ninewa. In the interview below he explains why he left Mossul and his commitment to working with Medecins Sans Frontieres in Ninewa. "Leaving Mosul was one of the most difficult decisions of my entire life. It meant leaving behind everything: my friends, my work, the city I was born in, my life there, and even the memories I had. In 2013, I was selected to go to the UK for training at Sheffield Halam hospital. Out of 400 nurses across Iraq, I was among the 13 candidates who came top of the exams. But months went by and my visa request kept being denied. Exactly one week before IS took over the city, I was told that the UK had finally rejected my application. It was the beginning of June; a curfew had been declared and I was stuck at home. The following morning my boss called me and asked me to come to work regardless. He said he would send an ambulance to pick me up. A hospital can never stop working, even during a war. A few days later, I was woken in the middle of the night by a great commotion outside. Assistant field coordinator Baroj in Hutheima. "We decided to work in Hutheima after a long assessment that involved speaking to many actors. We looked at security, health needs, access to health care, humanitarian needs and gathered as much information as possible, factual and cultural". Everybody was in the street and rumours had it that IS had crossed into town, meeting little resistance. People started to flee. I didn’t know what to do: I was torn between the need to get my family to a safe place and my commitment to the hospital. It was a time of great uncertainty. We weren’t sure who was in control until the following morning, when we saw that the barracks had been vacated – the Iraqi army had vanished. So we decided to leave. My wife was pregnant with our first child and was dangerously close to her delivery date. She would be giving birth in Dohuk now. For a while I kept in touch with my neighbours in Mosul – that was before ISIS banned cell phones. Now we can only use Facebook – but with a lot of caution. My home was looted so we decided to give it to a friend of my brother’s, rent-free. We have no news but I guess the family is still there or we would probably have heard something. Recently I was browsing the news on TV and social media, wondering if I’d recognise anybody among the thousands fleeing fighting west of Makhmour, when I came across the photo of one of my closest neighbours on Facebook. The woman – Sara, a widow in her late fifties – was being held up by her relatives as she walked across a militarised area. It was a relief to know she was safe, but also sad to see so much hardship. She had previously lost a daughter to cancer and she had just one son, my best friend for over a decade. He was a policeman, married with two young children. One day, soon after IS took over the city, two young people knocked at her door asking to see her son. She called him and, as he stepped out, he was gunned down in front of her. When she tried to hold him up she was brutally pushed aside. I showed the post to my mother, who knew her well, and the memories brought tears to her eyes. I would love to get in touch with her to see if I can help with anything. I am sure that when they fled they had to leave everything behind."